When I went off to college in 1977, inflation was high and rising, but the maximum interest rate you could earn on a savings account was capped by the government at a fraction over 5%. The conventional wisdom was "It's dumb to hold cash when inflation is over the rate you can earn." I absorbed that conventional wisdom, and it led me to make some dumb decisions. I had, through gifts and part-time jobs, managed to save over the course of my entire life up to then, about $1000. If I'd had any sense, I'd have understood that this sum was capital. I didn't, though--and because of that, I suffered from a lack of capital all through college. Because I didn't understand, here's how things worked out: The part-time jobs I had on campus earned me about $100 a month, which was pretty good money in those days. (In fact, it was all pretty good, except that the money wasn't paid until the 10th of the month after I'd earned it.) My expenses were pretty much zero (I lived in a dorm room and had a meal plan), so my earnings were pretty much entirely disposable, so $100 a month added up to plenty to keep me in pizza and sodas, with enough left over for all the pens and notebooks I could use. In fact, I generally ran a surplus over the course of the semester. The problem I faced though--over and over again-- was that the semester was front-loaded with expenses. The big one was books (about $100 to $150, payable as soon as the semester started), but also incidentals for the dorm room (tea, snacks, etc.). So, I showed up the first week of September, shelled out $150, and immediately found myself broke. And I stayed broke all month and well into the next month. Finally, on October 10th, I'd get $100 (not quite enough to get back to even). Worse yet, I typically had to send the money back to my bank, adding a couple days for the mail to get through--plus, banks in those days usually insisted on 5 to 10 days for an out-of-state check to clear. So I often didn't have access to the money until October 20th. I didn't have any way to go into debt, so I wasn't really behind all the time, but it sure felt like that--each paycheck would merely get me back even again, so the upshot was that I was behind all the time. Finally, after the semester was over, on the 10th of the first month of vacation I'd get one last paycheck for the last month of the semester--and, with my accumulated surplus, be back even again. The problem (aside from just not understanding capital) was that "conventional wisdom" I mentioned at the beginning. 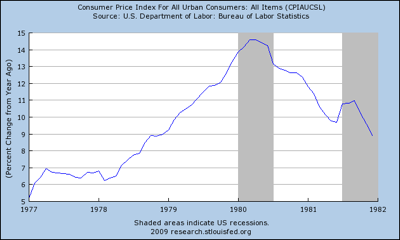 Here's a graph of the inflation rate from 1977 to 1981. As you see, it started the period higher than what a small saver could earn, and would soon soar to almost three times that. Most of those strategies required more cash than I had, but it just seemed dumb to leave my $1000 sitting in my savings account, losing purchasing power every day. Rather than do something as dumb as that, I went ahead and spent most of it over the course of my first year of college--hence my subsequent shortage of capital. In fact, though, none of that was necessary. Sure--if I'd stashed $1000 in a savings account earning 5.25% it would have grown to only $1227 by the time I'd graduated, rather than the $1500 it would have taken to have preserved my purchasing power. However, that downside would have been much more than offset by the advantage that I'd have spent 4 years being comfortably well off all the time, rather than being broke all the time. Plus, I'd have come out of the whole thing with $1227! This seems topical now, because even though inflation rates are low, interest rates are also very low. It's easy to imagine that, when cash earns almost nothing, it's dumb to hold it. It's easy to start thinking that you should invest it in something with a better return--or even just spend it. My counter to that is that holding a little capital returns a bunch of other advantages totally aside from the cash return--starting with the win of not being broke. When talking about money, the mental and emotional rates of return are rarely mentioned, much less measured. With ever-increasing news stories about greed, bribes, scams, frauds, and creative accounting practices--by our own government as well as publicly traded companies--knowing that my cash is safe in a bank account or CD earning little, but guaranteed interest, makes me feel a whole lot better than trusting my money to people who have proven to be untrustworthy. I've always felt like a sitting duck while invested in the stock market, but cash makes me feel empowered. Great post, and I agree with the comment made by atexasgirl. I've found that I make much better financial decisions when I'm not broke-the feelings of desperation over a looming bill or upcoming expense can push you into a mentality that is counter productive. I'm a bit confused. I think you might have left out a part but where did the $1000 go that you saved? You said you spent some of it over the first year of college but was that for necessary expenses (like the books) or the fun stuff? I spent the $1000 on stuff I wanted--I scarcely remember now what it was, but I expect it was books other than textbooks, meals out, stuff for the dorm room (I remember buying a couple of posters, plus a carpet sample that was just the right size to be a bed-side rug), clothes, bus tickets to go home during midterm, and so on. All the ordinary stuff college students spend money on. With lower interest rate, more people would be willing to borrow money and spend, which means higher demand. This might actually drive up pricing. Just look at the housing market. As mortgage rate is going up, I wouldn't be surprised that we'll see a further drop in housing price. The saving one might gain from the lowering of price might be higher than the additional interests one has to pay due to higher interest rate. If you're disciplined about it, buying stuff you're going to use anyway on sale or at a discount can lead to huge tax-free investment returns. But neither that nor low interest rates nor high inflation rates is a good reason to just spend more money.